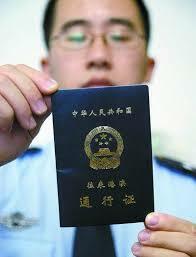 China Exit-Entry Permit Endorsement - Renewing It! I recently received an email from a client who’s wife is Chinese (PRC passport holder) and had to go through an extension process for her Hong Kong/Macau Exit-Entry Permit Endorsement (blue book) as it was up for renewal. As this is a China immigration document/process and not a Hong Kong immigration document process, we have no competency in these matters so I am very grateful for his sharing it in this way. Trust you find it helpful. I’m sharing below our experience and tips regarding the required process for Mainland Chinese temporary residents of Hong Kong when extending their Hong Kong residence visas. We hope this would be helpful for your other clients who are in this category. (1) When extending the Hong Kong visa, the Chinese passport holder must also renew his/her China endorsement in the Hong Kong/Macau Exit-Entry Permit book. This is because when leaving China for Hong Kong, China immigration must enter the number of that endorsement into their system – since they do not recognize the Hong Kong issued visa label). (2) This can be done in the hometown of that person, or, here in Hong Kong at the China Travel Service (CTS) in Central (2nd floor). (3) If that person went to China and now finds out he/she can’t return back to Hong Kong, the solution is to go/fly to Shenzhen, and then at Lou Wu go to 中青旅社 and tell them your endorsement has expired, and they’ll make a new one within a day. (4) Please keep in mind, that this is for a situation that the ‘endorsement’ (looks like a visa inside the blue Hong Kong/Macau Exit-Entry Permit book) has expired. It is not for a situation Hong Kong/Macau Exit-Entry Permit book itself has expired. (5) If that Hong Kong/Macau Exit-Entry Permit book expires, it can be renewed also at here in Hong Kong at the China Travel Service (CTS) in Central (that place also renews passports and seems like anything a mainland Chinese might need). Do you know how this exit entry thing work? Is is only valid for a certain number of border crossing or is it rather for a certain length of time? The reason I am asking is because I am married to a chinese lady who will get a dependent visa in HK when I move there for work. We will then be living in HK but she will still be traveling back to Shanghai on a weekly basis so I would find it very annoying for her if she had to re-apply for this every time she wishes to cross the border again (basically to come back home in HK). It’s for a fixed amount of time (5 years i believe). It’s a document issued by the PSB in the location where you wife holds her household registration.